Young players, coaches, and parents are being led astray by the siren-call of weighted balls and the promise of a short-cut to turbo-charged velocity. Don’t buy it. Stay away. Stay away. Stay away. This is a huge distraction from the real work needed to address the root cause of issues for the vast majority of young players we see regularly here in Northern Virginia. Players’ arms are hemorrhaging and coaches are pushing wet-naps and bandaids when tourniquets should be used. Put the weighted balls down until you can show proficiency performing basic human movements like crawling, stepping, reaching, squatting, and others we regularly screen for at DSP. Most clients ages 10 – 18 are be unable to perform those simple movements with sufficient proficiency. This includes players regularly selected for All Star teams. Imagine the level of unpreparedness in the bodies of players that don’t train with DSP or any other competent trainer! I feel bad for those players. Don’t be fooled by “good results” in games within your league. Process trumps results every time. Focus on the quality of basic movements. Then focus on adding power to those movements. Only after those are in place should you consider spending time on skill work! The baseball community needs to understand what is most important. The most important thing is keeping the most important thing the most important thing. If a 13 year old can’t maintain a neutral spine when performing one push-up or squat while evidencing good ankle mobility, is it really wise to add load on top of this dysfunctional body? Some claim that the added heft of the weighted balls cleans up movement patterns. Maybe. Maybe not. There are no peer-reviewed journal entries to back up that statement. I’ve not seen evidence of that in the studio. Here is what we do know through peer-reviewed journals and our experience: ball and socket joints work better when the core is able to stabilize the spine during force production and absorption. Read the previous sentence again if you are unfamiliar with this concept. It is hugely important. There is an old maxim in the PT and strength training world: Proximal Stability for Distal Mobility. It is still on the money. Get strong up the middle and the extremities can function more efficiently. That’s old news for leading edge trainers. Unfortunately the baseball community, especially at the youth level, is ignorant of the existence of this concept, let alone its meaning and impact on arm development and injury prevention. The players of today are weak, immobile, and unable to produce and absorb force with efficiency…All-stars and high school players included. I’m not trying to be cruel. It is simply a fact. We see it every time a new client walks through our doors. Sure, players need to be stronger from the shoulder, through the elbow, and to the hand. I suppose that is why people throw weighted balls. The focus is mis-guided though! It would be like worrying about using a really good synthetic oil instead of regular oil for a car that isn’t firing all cylinders. Who cares about the oil, folks? Get the engine working first! The force generating and transmitting parts of these young bodies are broken. That is where your attention needs to be focussed right now. Fix the core and the posterior chain. After a few years of working on those, then perhaps one might spend some time searching for benefits that might flow from weighted balls. But Coach, I Hear Weighted Balls Get More Velocity! You get more velocity and arm health by strengthening the body where it matters the most and learning to use bio-mechanically efficient movement patterns. This is what we do at DSP, week after week. Season after season. Check out some of the clients that picked up 4 – 12 miles per hour over a 10 week program this Winter. There are many more examples we can share for anyone interested. No weighted-ball threshold-building regimen was used. He added 12 mph in Five Weeks! Velocity from Better Movement Patterns! Our formula for getting players out of pain and onto a safe path for greater velocity and command is executed regularly through a process of assessment, education, and customization. Our process gets clients more athletic. We do this via our favorite tool, the kettlebell. Are Weighted Balls Good for Anything? 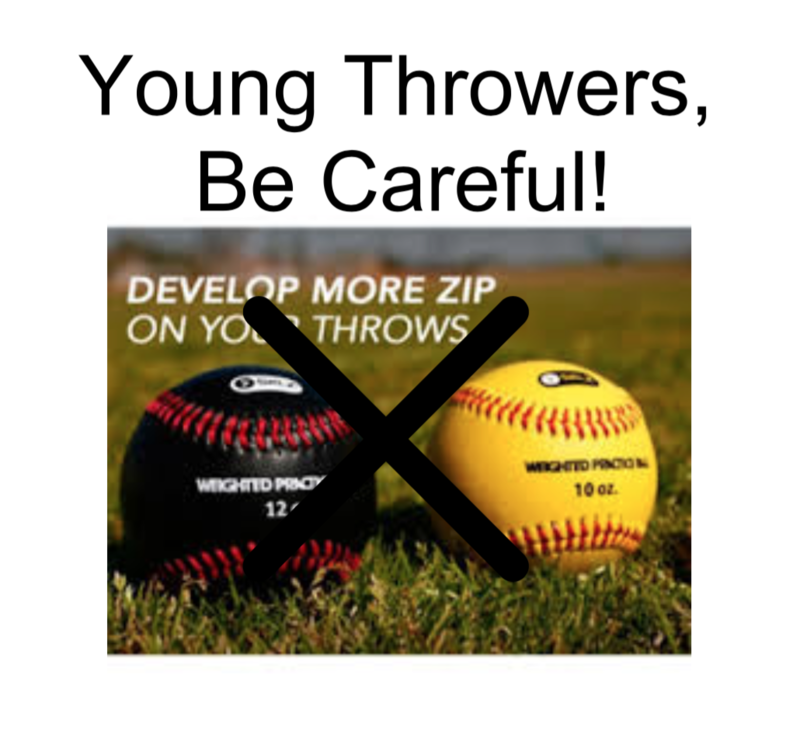 Know that I do think weighted balls can have a place in the arm-development tool box, just not for 98% of the young athletes we regularly see at DSP. That’s because the most glaring and important constraint almost all these players have is weakness in their core and posterior chain, things that can’t be touched by using weighted balls. Sure, the shoulder and arm are very important, but their importance is further down the chain of importance than the real culprits causing arm pain, constraints like weakness and immobility in the core, hips, fascia, T-spine, and more. To be even more blunt, these kids don’t know how to breathe efficiently. Focus on what is important. There will be more on breath-work in future blogs. Legitimate uses of different weighted balls that we have offered at DSP include a) stimulation of interest/feel and b) subconscious problem-solving. In simple words, some players like to experience throwing balls of varying weights. That is some good emotional impact. It gets them stirred up and interested in throwing more. Young players need to throw more (but not pitch more in games) to create the adaptations necessary for future proficiency. We offer clients 3.5, 5, and 7 ounce balls with which they can experiment. It is up to the clients to decide if they want to use them. We are not one-size-fits-all so not all clients use them. They are just one of many tools we have. The problem-solving aspect occurs when the mind-body has to figure out how to adjust muscle recruitment when the weight of the ball changes. Imagine picking up rocks by a river and trying to throw them at a target in the middle. After a while, a database of the trial-and-error experiences for varying weights will have been created. Do this a lot and you may develop a good problem-solving machine that theoretically could come in handy down the line. At DSP, we have been training players aged 9 – 20 for many years and have learned much. We continue to learn with every new client. None of these clients, nor their peers, should be relying on weighted balls to develop their arms. It is at best, an inappropriate use of time for the typical young athlete that walks around with physical constraints and throws with inefficient movement patterns. At worst it can mis-lead and lead to injury. Young players are riddled with physical constraints and must address those critical constraints before even thinking about the distal parts of the body like the arm. We know young players have constraints because we assess them using the Functional Movement Screen. There is no guessing. The constraints get revealed and addressed. The most important thing is keeping the most important thing the most important thing. The most important thing for a thrower is to have a body that can perform basic human movements with great proficiency. Crawl, walk, run. Let’s make sure they can literally and metaphorically crawl before debating the use of a tool that doesn’t address the source of dysfunction. If you would like to know more about arm care and development, how we train our athletes, or why we like using kettlebells to get our clients explosively athletic, please contact us.